With our beautiful waterfront location, stunning setting and restaurant Port Arthur Lavender is a popular venue for weddings and other special occasions. Just 1.5 hours from Hobart, the property is situated among 18 acres of lavender, rainforest and lakes. Our café, essential oil distillery and retail outlet overlook Long Bay and the beautiful lavender fields making it a relaxed and peaceful atmosphere for the perfect event. Port Arthur Lavender has the space and facilities to cater for events for up to 150 guests. Our natural outdoor amphitheatre is a perfect area for pre-dinner drinks and canapés. The restaurant seats up to 100 people. 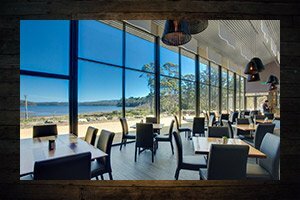 Function bookings are given exclusive use of Port Arthur Lavender property and facilities. For more information about our function package, please send us an email info@portarthurlavender.com.au with a description of your function.